Magnum Series tractors combine performance, comfort and reliability. Look after yourself and minimise fatigue with the low noise levels climate control and excellent visibility on your front and rear implements. The new split wide angle mirrors dramatically reduce blind spots for safer and easier driving. The 360-degree LED lighting package will enable you to carry on working after dark without slowing down. The 5-point suspension system (cab, seat, axle and rear linkage) provides a remarkably smooth ride. You have a perfect overview of all your Magnum’s functions: the Integrated Control Panel gives you all the key information at a glance and the AFS Pro 700 screen integrates the data from the tractor and implement. The new multi-function handle makes operation even easier, with more pronounced and backlit buttons for a greater feel and operator experience. Your Magnum’s controls are all at your fingertips. The powerful 8.7 litre, 6-cylinder engine is designed to generate power and optimise fuel efficiency. The flatter torque curve of the new Magnum delivers maximum torque at greater range of engine speeds. You can choose the proven Full Powershift Transmission with Automatic Productivity Management (APM) that automatically reduces engine speed to match power requirements. Or you can opt for the Continuously Variable Transmission that makes the Magnum CVT the perfect all-rounder on the road and in the field, with the CVT speed range from 0 to 50 kph. With the new Magnum, you can count on a massive lift capacity of 10,580 kg. If you need to operate big implements with your Magnum that require high hydraulic flow, you can opt for the twin-flow 282 litre pump. You can have up to 6 electro-hydraulic remote valves to enable a high number of functions without the need to reconnect hydraulic hoses. The heavy-duty PTO meets the greater requirements of the higher engine power. The 1000 PTO speed is achieved at 1,803 rpm, where there is a huge power growth. Dual speed 540/100 is standard equipment. The integrated AFS Pro 700 touchscreen gives you all the key data, from fuel consumption to engine and PTO power, at a glance. It also enables you to adjust easily and quickly the settings for different implements and working conditions. The Magnum is ISOBUS ready to control compatible implements. To maximise your efficiency, you can choose from a full range of guidance solutions, offering accuracy levels of up to 2.0 cm. Model Year 2015 Magnum tractors feature a freshly styled roof top. With the optional full 360 degree lighting package, the Magnum lighting enhancement makes operating at night look like operating during the day. The sleek new roof design incorporates a bulkhead mounting for the AFS GPS receiver, reducing the risk of damage from branches or debris. The simple, adjustable suspension in a Case IH Magnum Surveyor™ cab stabilises front-to-back and up-and-down motions. It gives you a smoother ride whether on the road or in uneven terrain, for reduced operator fatigue and increased productivity. Adjust your speed, gears and direction, and much more without even raising your elbow. The Case IH Multi-Control Armrest, with MultiFunction handle and the optional AFS Pro 700 control centre, puts 85% of the controls operators use most at your fingertips. Guided by customer input, Case IH engineers upgraded the MultiFunction handle with new larger, raised, backlit buttons with a softer touch and different-sized buttons. You can tell them apart by touch alone, to make switching between functions even simpler. Magnum CVT models feature an exclusive split-throttle design that allows the operator to select working speed or RPMs. The CVT automatically selects the most efficient transmission range for the desired speed or load, eliminating the need for manual clutching or shifting. The simplicity of Case IH CVT technology makes it ideal for less experienced operators to maintain peak efficiency. There’s no breaking traction during shifting, giving you smooth operation in all field conditions and applications – from sowing and hay baling to harvesting, hauling and transport. Magnum series tractors engines are produced by FPT Powertrain Technologies, a Case IH sister company. Case IH and FPT engineers work alongside each other in Burr Ridge, IL, USA Engineering Center. FPT, one of the world’s largest engine manufacturers, produces nearly 3 million engines a year. Magnum Series 200 to 240 tractors, equipped with a suspended front axle, now offer the option of front dual tyres that distribute the tractor’s weight over a greater ground surface for more traction and a better ride quality over rough ground. The improved Surround Frame helps deliver power to the ground whenever you need it. This is the versatility you demand from a row-crop tractor. Front hitches are available factory installed on the 250-380 models giving you the ability to handle more 3-point implement applications. The front PTO is designed to provide better alignment of the PTO to the implement. Keeping all your tyres on the ground is crucial for stability and efficient performance from your tractor. The Magnum’s front-axle suspension ensures that tyres stay perpendicular to the ground for stability, traction and control over rough terrain. And that means a better ride at higher speeds. The simple design keeps you from bouncing and jarring in the cab. The solid construction minimises the number of moving parts, which means fewer service requirements. Hydraulic flow that handles all your row-crop applications and even takes care of loader, baler and mower work. Magnum tractors feature up to 225 lpm hydraulic flow so you can run at lower engine rpm for increased fuel efficiency without compromising operational performance. The easy to use quick-connect valves make your operation even more efficient by maintaining precise flow and pressure, even in the most severe conditions. Set the system how you want, and it adjusts for changing temperature conditions through the day. The Magnum 250, 280, 310, 340 and 380 have an optional engine brake for better control of larger implements in the field and on the road. It uses the compression of exhaust gas within the engine to slow the tractor, saving wear on brake pads and helping to reduce operating costs. Control the engine brake by engaging the engine brake button on the right armrest. When the engine brake is activated, and the difference between the commanded and actual engine speed exceeds a set threshold, software automatically activates the brake. Today’s powerful lineup of Magnum tractors is engineered to make your job easier and more productive, allowing you to keep up with the demands of farming. Delivering an impressive 170 to 315 PTO horsepower, there’s a Magnum tractor perfectly suited to your needs. They have improved horsepower curves for better low-end performance and more fuel capacity for longer run times. 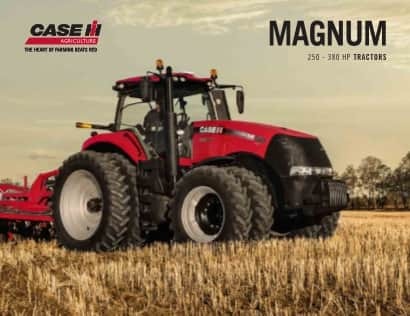 Be ready for the challenges ahead with the all-new Magnum tractors from Case IH. And you control it all from the Surveyor cab, the industry’s largest, with more glass than any other cab, so you can see all the angles. The Magnum 250 to 340 tractors have the power to take on the toughest tasks, with PTO horsepower ranging from 205 to 290 and standard 19-speed, full powershift transmissions. Handle hard-pulling applications with up to 14 percent power growth and 35 engine horsepower Power Boost. More built-in ballast improves traction, reduces compaction and means your tractor’s horsepower gets to the ground. Add the standard Magnum Surveyor cab with adjustable suspension, heated and ventilated seats and ergonomic Multi-Control armrest and you are ready for every long day in the paddock. Experience the industry’s leading Continuously Variable Transmission (CVT), which is an option on all models and standard on the Magnum 240 CVT (270 maximum-boosted engine horsepower) and Magnum 380 CVT (435 maximum-boosted engine horsepower). The CVT uses proven Case IH technology to deliver uninterrupted power to the ground, adapted with four ranges to be more efficient and deliver more power for tough jobs. The operator simply sets the split throttle to the appropriate minimum and maximum engine RPMs, and the Case IH CVT automatically adjusts to match ground speed and load. Magnum Rowtrac tractors are designed to strike the perfect balance, with tyre options that fit your row width and soil type and an oscillating rear-track design that keeps the power on the ground through the tightest turns. These tractors keep four points of ground contact, which reduces surface pressure and means less weight transfer from front to rear than two-track systems. And it offers manoeuvrability and handling comparable to a wheeled tractor. Out in front, Magnum Rowtrac features advanced high-tech tyres that work with lower air pressure – about 40 percent reduced PSI compared to traditional MFD tractor tyres. That means a longer footprint on the ground for reduced compaction. Multiple tyre options make it easy to match rear track width to fit most any row crop practice. This exclusive rear track oscillates and pivots to maintain a flat footprint that keeps the power on the ground. This design produces traction that is unaffected by hitch or drawbar load, plus improved ride over terraces and other uneven terrain. Whether you plant rice or cotton, potatoes, soybeans, maize, or even vegetables, the Magnum Rowtrac undercarriage design adapts to fit the way you farm. A wide range of axle spacing options gives you the flexibility you need. Available row spacing: 20", 22", 30", 34", 36", 38" & 40"
Available track widths: 16", 18", 24" & 30"
Crops don’t wait for repairs. Maximum yields require maximum uptime, and Magnum tractors are designed with this in mind. We make it part of every feature, from daily maintenance to working with any implement. With special attention paid to the ease of ground-level service. And Case IH dealers and technicians are certified to keep you running. Maximum uptime is always on our mind. Because it’s always on yours. Checking your tractor’s transmission oil or hydraulic fluid can be done while standing on the ground. Because your tractor needs to keep running, the Magnum makes it easy for you to keep on top of maintenance as quickly and effortlessly as possible—and routinely. The industry-leading 600-hour engine oil service interval helps keep you in the field. New right-hand service steps make it easy to clean glass and adjust mirrors. And Case IH dealers and technicians are ready to handle any service issues to keep you going. To deliver the quality you expect, Case IH designs components in-house. They are built to exacting Case IH standards. Plus, we manufacture our own high-quality gears and drive-train to maximise durability and reliability. Quality control stays in house and assures your Case IH tractor is going to last year after year, and it’ll stay ready for any demand you put on it. Maximising power requires the tractor to be properly weighted and ballasted. With Magnum tractors you won’t worry about loss of traction and increased compaction in tough field conditions. Magnum tractors are designed for optimal weight distribution and can be adapted to meet your specific needs and application. Let your dealer assist with proper weight distribution to save you money through improved fuel economy. Factory-installed AFS components, including AFS AccuGuide™ autoguidance, offer dependability and convenience. Integrating AFS with the tractor at the Case IH plant ensures correct installation, testing and a higher level of quality. And your tractor arrives closer to field-ready when it gets to the dealer because you don’t have to wait for a technician to install additional components. You also benefit from the added capability of using the AFS Pro 700 control centre with third-party implements. Even move the Pro 700 between all your Case IH equipment. Autoguidance and other precision technologies simplify your work. Getting that technology on your tractor is just as easy. That’s what you’d expect an autoguidance system to deliver. And AFS AccuGuide does. Eliminating the guesswork of row spacing ensures each row is identical, meaning fewer end-of-row turns and overlaps. It maintains perfectly straight and repeatable rows with RTK accuracy. And it controls traffic patterns and decreases compaction from overlapping passes – benefits that bring higher yields. That adds up to less stress and fatigue for you at the end of the day. With the AFS Pro 700 control centre, you benefit from added capabilities with minimal complexity. It is easy to read in daylight and adjusts for night visibility. It features one of the largest screens in the industry in a lighter, thinner package, with significant computing power. A single display provides control functionality and simple integration for not only the tractor AccuGuide™, but Case IH Early Riser® Planters, Precision Disk™ Drills and Air Carts, LB Series Balers, AFS AccuControl 3rd party controlled implements, and ISOBUS compliant implements, just to name a few. Your one stop shop for total machine and implement control is the AFS Pro 700 control centre. AFS software pulls together numerous sources of data about your farm and gives you the information you need to consider how things are changing. Using customisable and configurable screens, layer yield and moisture maps over aerial photographs and compile additional useful information with precision farming help from third-party information providers. Adapt charts, graphs and layered maps for further analysis of variety / hybrid, plant population and soil topography. Create boundaries, autoguidance lines, compare farming practices and field-to-field yields from year to year. Because autoguidance doesn’t stop working for you once you get out of your tractor. Best of all, its information you own and you decide how to use it. The AFS 372 receiver uses the GLONASS satellite system, which increases the number of satellites available to the user, resulting in less downtime during periods of low GPS satellite availability. Less downtime translates into greater productivity, efficiency, and overall system reliability. The receiver common mount and plate allow it to be transferred easily among multiple pieces of equipment.